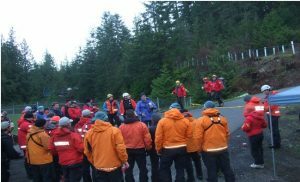 This past weekend, April 8th and 9th 2017 Lions Bay Search and Rescue (LBSAR) conducted our largest response and recovery in the history of the team. 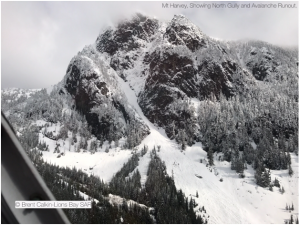 Our condolences to the families and friends of the five snowshoers who plummeted to their deaths from the summit of Mount Harvey when a ridge cornice gave way. The five fell to the Northwest side of the mountain falling 500m where they were then consumed by a large avalanche that travelled down the ramp to the valley bottom. LBSAR is most grateful to the immediate response by nine other teams when called. 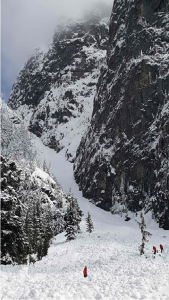 By Sunday morning avalanche qualified field volunteer SAR response teams from Pemberton to Chilliwack, CARDA and RCMP dog teams, Professional Canadian Avalanche Industry Resources, RCMP and Coroner all descended upon the School field staging area. In total over 70 field ready personnel were at the staging area. LBSAR is especially thankful to the amazing services provided by Village ESS in keeping searchers fed and providing a reception area for victim services and heartbroken families. The Salvation Army crews scrambled to attend the scene and provide nourishment to weary and hungry returning field crews. Our Mayor Karl Buhr and Councillor Fred Bain were continuously available to liaison between Village resources. Numerous Village residents stopped by to drop off fresh cookies, energy bars, best wishes and offers of help for the ongoing operation. In excess, of 100 volunteers were involved in this tragic event. Sunday the weather cooperated and the remaining snow was deemed stable enough to allow initial search efforts to commence. As the subjects were not wearing avalanche transceivers, the early use of avalanche dogs allowed for all five subjects to be recovered- truly a remarkable feat given the size of the avalanche. At the height of the operation 42 field members were combing the avalanche debris with dogs and probes. 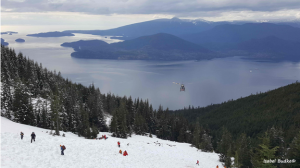 All members were transported in and out via helicopter for searcher safety avoiding several other possible avalanche paths if crews approached via ground routes. Again, we thank all of those that assisted in this difficult situation and to Village Residents for their patience and understanding.